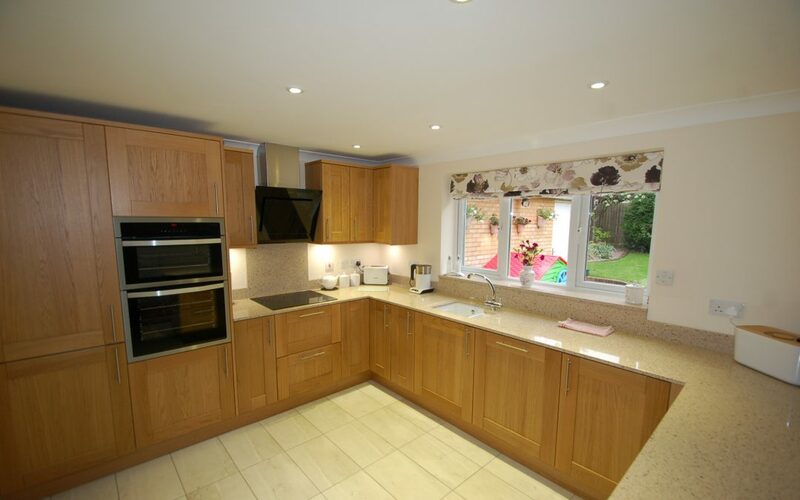 Our clients are a retired couple living in Kings Hill, West Malling, they had a modern house with a fairly new kitchen however they were disappointed with the quality of the kitchen and the finish of the doors. 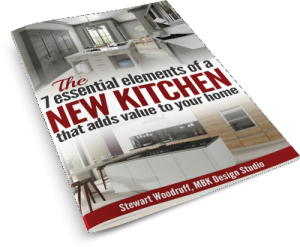 They wanted a radical change in the look of the kitchen both the feel and the functionality. All the floor tiles were to be removed from the kitchen and the hall as they were old fashioned and very bland. 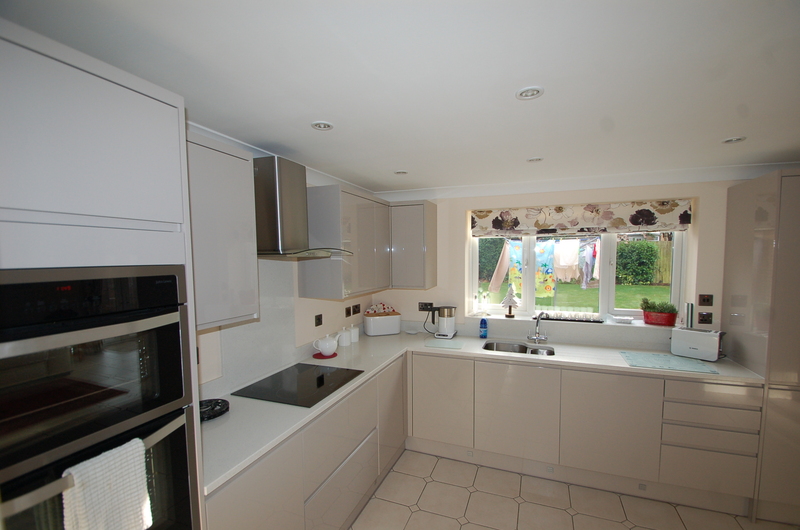 The kitchen was linked to both a utility room and a family area and it was a very open space but there was no division between the kitchen and the family area. The clients wanted to create a division between the two rooms and also remove existing radiators and install underfloor heating to give a warm ceramic floor and clear walls. 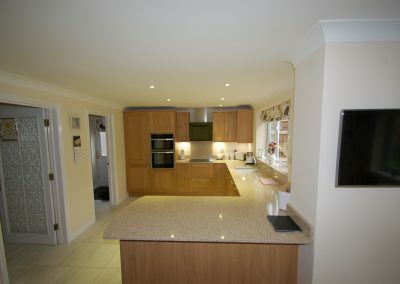 By installing an Oak Shaker kitchen by Ashley Ann of Wick we were bringing back warmth into the kitchen. In order to separate the kitchen from the family area we designed a peninsular to form a partial barrier and somewhere where you could place a stool so members of the family could sit and converse with whoever was working in the kitchen. To enable us to do this we moved the existing integrated fridge next to the oven housing giving us the space to create the peninsular. 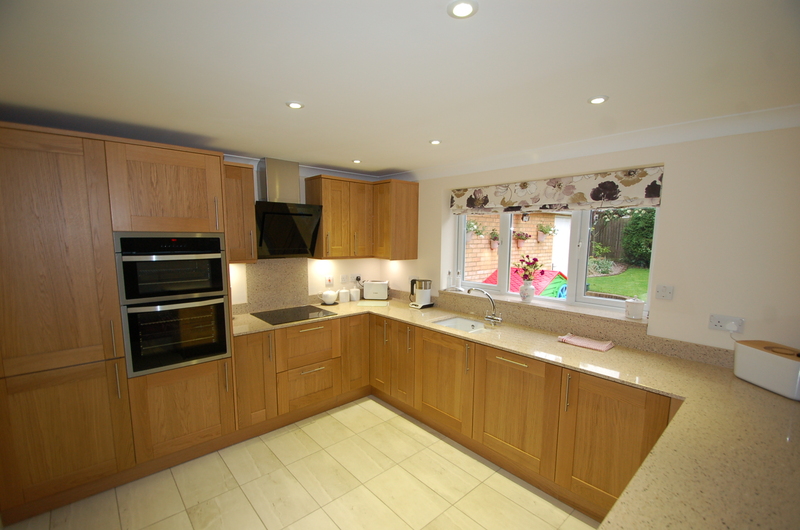 It was confirmed that they should have a natural oak shaker kitchen door with a cream quartz worktop together with a ceramic stone effect cream floor. 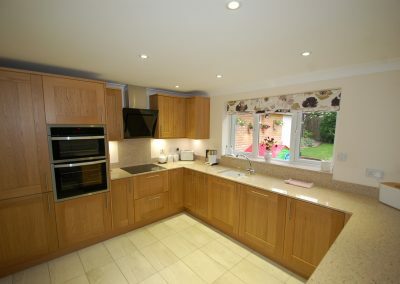 This changed the kitchen from a cold room to a warm and friendly area. We had to remove over 43 sq m of ceramic floor tiling in the kitchen, family room, utility room, hall and downstairs cloakroom, which damaged the screed, we insulated the floor, installed electric underfloor heating in the kitchen and family room with separate thermostats and supplied a latex screed to whole floor area to keep the levels consistent throughout the four rooms. The floor was then covered with a stone effect ceramic high definition floor tile. 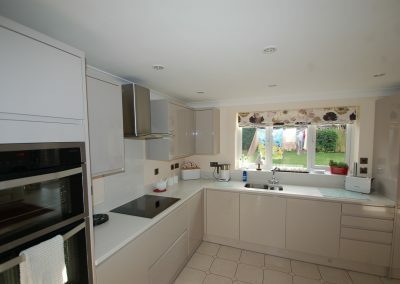 We installed the kitchen and utility room and the worktop was installed, cream quartz, with an under-mounted ceramic sink and a recessed drainer. We replaced the hob with an induction hob and installed a new extractor. We also included new ceiling lighting, under wall unit lighting and magic corner basket system and a water treatment system to reduce the lime scale in their water. 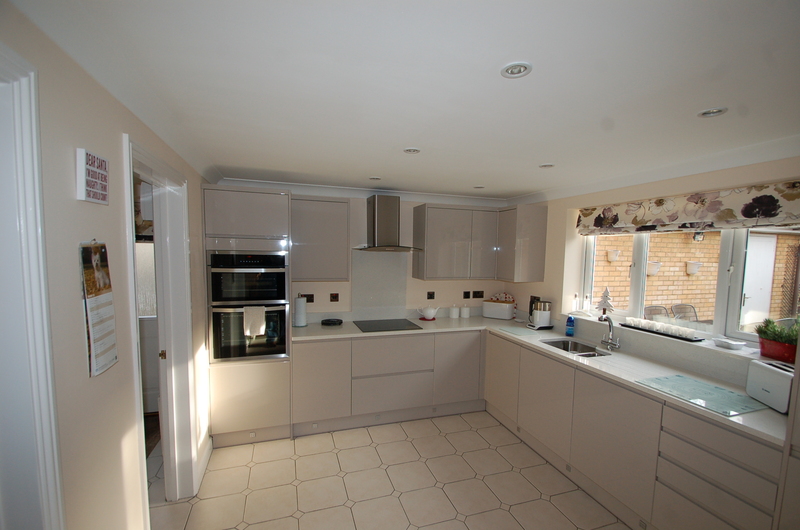 As you can see from the before and after pictures a simple change of colour can dramatically alter the feeling of the kitchen. 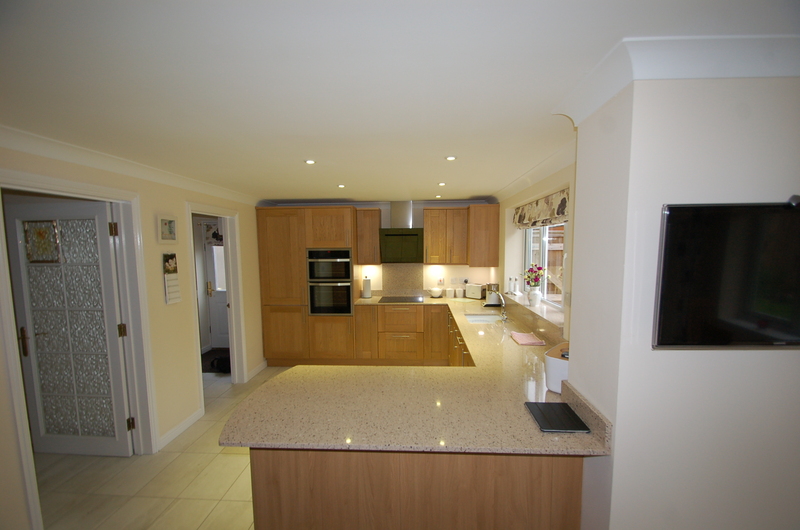 The whole project took 5 weeks to complete and cost £26,500 including all the materials and labour required and our clients were overjoyed by the finished project. Don’t hesitate to get in touch today and arrange a visit to our showroom to meet and discuss your requirements. 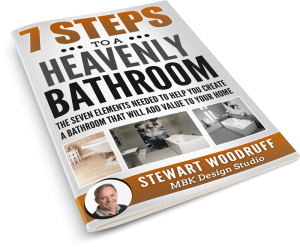 It’s YOUR project and we want to help YOU achieve the "Kitchen & Bathroom or your dreams"